This hymn dedicated to Goddess Durga depicts how she cuts down her enemies to hundred pieces. She has torn apart the demons with her sastras and brought down the toughest of demons. These lines depict a small perspective of Indian minds towards the female role in combat. Ancient India has given rise to many male warriors of great fame and valor. Songs and poetry have been written on them. But what about the Indian women? Do we hear about them in combat roles and in warfare? Diving deep into the depths of our ancient history is the answer. In Vedic era, we see the advent of the Goddesses like Durga and Kali who yield weapons; they were skilled warriors and considered as invincible in the warfare. The ideology of female in warfare was thus imprinted long time back. It is interesting to note that once ‘Bharatvarsha’ was having a matriarchal society in pre Vedic era, where the females were responsible to keep the household safe and secure and they were considered the head of the family. However, this concept gradually degenerated in the Vedic ages and women took the backseat. Though we get to know some Indian women warriors like Vishpala, who was helped by Ashvins in battlefield. Her badly injured limbs were replaced with legs of iron and she kept on battling. During the Ramayana and Mahabharata period, we see minor characters like Lankini (the keeper of Lanka) and Shikhandi (it is said that he was born as a female) who were well versed in the art of warfare. In Jaimini Bharatam written in Kannada, Arjun visits a land that belonged only to warrior women, something in the line of Amazons from the Greek mythology. Here, Queen Pramila captures the Ashwamedha horse of Arjun. The prince finally marries her and she accompanies him in the rest of the journey. We again get a reference of this mythical land of Indian women in the tales of Nath Gurus, Matsyendranath and Gorakshanath. In the age of Mauryas, the kings used to keep female bodyguards. These Indian women were heavy built, robust, and who knew the art of warfare. They were trained specially in combat of close quarters. Their loyalty was considered better than their male counterparts. During this era we do not see much of female names in battlefield. However, they helped the males in battlefront by providing foods and medicines and sometime accompanying them in war. In the medieval era, several references of female warriors, who took active part in combat roles, find mention. During the 6th century, most of the social customs and practices took their shape by intermingling of Hindu and Buddhist doctrines. The society was heavily patriarchal in nature; however, sparks of brilliance were noticed from time to time. At the advent of 11th century we see Queen Rudrama Devi of Warangal. She was a tough fighter and she trained her army in a particular style of martial art which was effective in defeating her foes. She pushed the Eastern Ganga dynasty beyond the river Godavari and defeated Yadavas of Devagiri, who ultimately surrendered large chunks of territory to her. She was well versed in the art of hand to hand combat and in swordsmanship. Southern India has seen many warrior queens during this era, such as Rani Abbakka, Keladi Chennamma, Kittur Chennamaa, to name a few. Rani Abbakka was a force to reckon with in Mangalore and southern Konkan region. The Portuguese had tasted several defeats in her hand. Keladi Chennamma fought valiantly against the Mughals and was much praised by Marathas. Kittur Chennamma showed her valor against the British in several pitched battles and defended her territory till her death. In North India, various Rajput women fought bravely in battlefield. Rani Durgavati of Gondwana defeated Baz Bahadur and his troops in a battle and nearly defeated the Mughals till an arrow pierced her eye and she died of injuries. 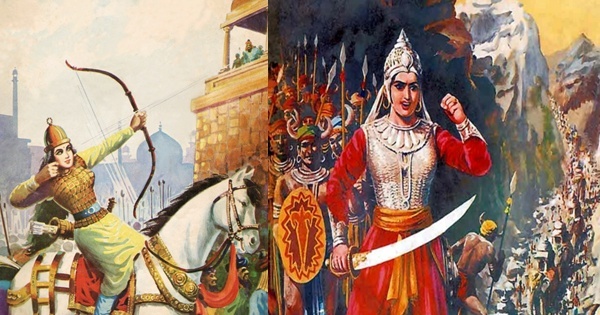 It is also said Rani Padmini was also trained in the art of warfare; she was one of the chief strategist to free her husband Rawal Ratan Singh from Alauddin Khilji. Rani Karnavati of Garhwal was famous for cutting the nose of the invaders and for defending her kingdom fiercely. She earned the nickname “Nak kati Rani”. Rani Karnavati defeated several Mughal forces in the Doon valley. In Bengal where worship of Maa Durga is common, there is mention of a queen called Rani Bhavashankari of the Bhurshut kingdom. She defeated the Pathans in the region and established peace and prosperity. From western India, Tarabai was like thorn in the flesh of Aurangzeb. Tarabai conquered several Mughal areas and fought off Aurangzeb’s troops on several occasions. Laxmi Bai the famous Rani of Jhansi and her aide Jhalkari Bai is considered as epitome of female bravery till date. All of them are classic examples of bravery of Indian women in battlefield. During Muslim rule, Muslim women remained under purdah so that no one could see their actual faces. However, there were exceptions. Raziya Sultana of the Slave dynasty fought on horseback and had warlike talent. She was a good ruler but she could not check the Muslim clergy and the nobles of her court which brought her downfall. Nur Jehan, the wife of emperor Jehangir was a woman who held the strings of the empire. She was the chief strategist behind her husband’s decisions and also led from the front while rescuing her husband from the rebels. Chand Bibi of Ahmednagar was the brave and courageous leader who resisted the Mughals for a while. In the later half of 19th century in the Great Rebellion, we see several prominent Muslim Indian women like Begum Hazrat Mahal, Azizun Bai, to name a few, playing active roles. Image source: fscclub.com. 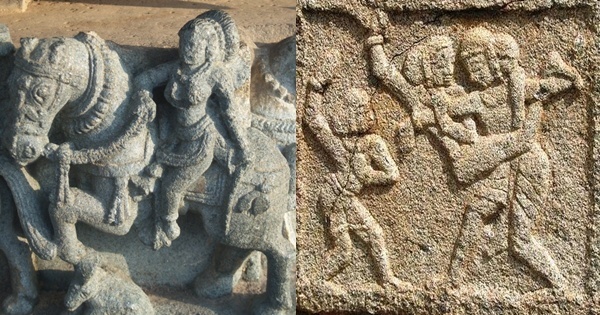 Indian female warrior sculpture from Belur, Karnataka and ancient bas-relief of women wrestling in Hampi, Karnataka. We might have a question that all of the above mentioned names are from royal lineage or related to royalty. What about the common Indian women? Yes, they did participate in war, sometime as frontline soldiers and sometime as back up or reserve troops. They participated in various martial arts like Silambam, Wrestling, Kalari etc. Silambam was practiced primarily with bamboo sticks; common female folks take active participation in this art. Onake Obbava killed nearly a hundred soldiers of Haider Ali by using her pestle (a thick wooden stick) while they were clawing inside Chandragiri fort through a small entrance. She was the wife of a soldier; she wasn’t trained in warfare. This inhumane feat has immortalized her in many a local legend and folklores. In wrestling, we get glimpses of women in the arena. It is said that in the Vijaynagara kingdom females used to wrestle in close quarters where kings and queens used to watch them. In one of the hero stones, a wrestler called Hariyakka finds mention. She was the daughter of Madigauda a wrestler. Once he was challenged by an opponent and was killed in the bout. His daughter Hariyakka avenged her father’s death by wrestling with her opponent and finally killing him with a dagger. She was a tall, well trained wrestler and the hero stone depicts that she towered over her opponent. Her imagery shows her of humble origin and the way she impaled her opponent shows her power and skill in this field. May be in the future archaeologists will unearth more Hariyakkas. Kalari was practiced by many females in Kerala and it became a principal defensive weapon against the invaders. Uniyarcha was a legendary female warrior who won many fights by using Kalariyapattu. Meenakshi Gurrukal is a prime example from modern day who is well versed with this art and she even defeated her male opponents at the ripe age of 76. Boxing was a sport with major participation from male warriors but Saint Mai Bhago, a female warrior from the Sikhs was well trained in this art. She led her assault on her enemies successfully by using skills of martial art and swordsmanship. Uda Devi, a woman of Dalit origin took active part in the 1857 Great rebellion. In the battle of Sikander Bagh, she climbed up a peepal tree with her old cavalry rifle and shot down nearly six dozens of British soldiers until her death. She was earliest known female snipers! Another Dalit freedom fighter of that era was Mahabiri Devi who formed groups of female resistance units and killed several British officers. 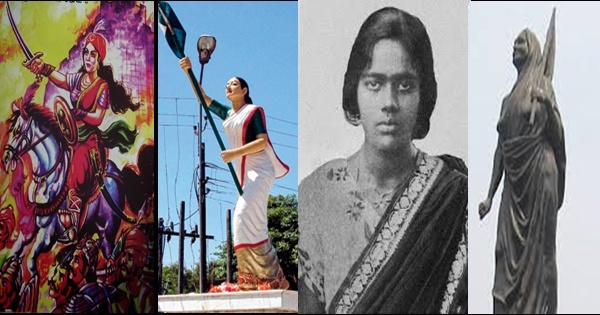 There is also mention of other Indian women fighters during this period. Worth mentioning are Asha Devi, Bakhtavari, Habiba, Bhagwati Devi Tyagi, Indra Kaur, Jamila Khan, Man Kaur, Rahimi, Raj Kaur, Shobha Devi and Umda, all of whom sacrificed their lives in active fighting. We see the formation of Durga Dal by the Rani of Jhansi which was the precursor of INA’s female battalion. The women of Durga Dal laid their lives valiantly fighting against the British army. India is now in the path of regaining her lost glory and we need our women to stand beside our men shoulder to shoulder so that the nation can make steady progress. Our armed forces do not have the women in combat roles. However, given the history and the rich heritage of Indian women, it will be a good idea to give them combat roles. Enemies will not sleep soundly if the daughters of India start taking them down. We are still facing lots of issues regarding rapes, female infanticides, violence against women, gender inequality in work. But if we are to build a bright future, we need our women and we need them not only in our back line but also in the front line. Debraj Gupta is a history enthusiast, an avid traveler, and blogger. He works for e-commerce giant Amazon. His interests are visiting historical places, composing poetry, and researching about mysteries and paranormal stuff.